The Episode starts with Vedant happily talking to Dada ji’s pic and says for the first time, all family members will celebrate Maha shivratri altogether and asks him to bless them so that they will stay altogether always. He says I know time will be taken, but everything will be fine. Sumiti gains consciousness and tells that good Ramesh can’t be bought even in the market, and says may be it was a dream. Sanju says it was all truth. Sumiti says may be there are two Ramesh, and says may be double role. Radhika says may be his behavior towards Vedant changed for good. Narendra hopes they stay as a happy family. Vedant plays flute. Purva and pankhudi come there. Vedant asks her to make arrangements of Mahashivratri and says this is your first after marriage. Purva asks what are you saying? Vedant says whatever you heard. Dadi talks to Dada ji’s pic and says Vedant is fulfilling your dreams. Ramesh is angry in his room thinking about Vedant’s condition. Gomti is also angry in her room. Vedant dances with Purva. Tu nazm nazm sa plays…..
Everyone comes to dining table to have food. Manjula is looking happy. Sumiti says they shall get Ramesh checked. Manjula says change is good. Dadi comes there. Everyone ask her about Ramesh’s behavior. Dadi says Vedant didn’t tell her. Ramesh comes with Vedant and asks Manjula to sit with him and have food. Manjula gets happy to get respect and love from Ramesh. Vedant smiles and looks happy for Manjula. Ramesh tells Manjula that he will serve her food. Vedant signs him. Ramesh tells Dadi that they all will celebrate Mahashivratri together. Vedant says you had said that you will take Maa for shopping. Ramesh gets angry , and gets up from his seat. It was Ramesh’s imagination. Vedant asks will you take maa for Shopping. Ramesh says I was thinking the same. Radhika says they shall keep programme at home. Sanju says they will do the skit. Dadi asks where is Gomti? Gomti comes there as a sadhvi and tells that she has left the world happiness. Ramesh asks what is all this? Gomti blames and curses Purva. Vedant says I will search good guy for you. Gomti asks him to be quiet and says my Preetam left me because of this dayan. She curses her and says your husband, sister and Nani will be ruined. Purva asks her to stop it and says I didn’t do anything and will not her all this. She leaves from there. pankhudi follows her. Ramesh smiles. Vedant tells Ramesh that everything will be fine. Ramesh says I am not worried as vedant is here. Vedant signs Dadi not to worry. Ramesh calls Vedant to room and calls him Gudadi and asks him to stop his drama. Vedant asks him to tell everyone, how he was proved to be a bad brother and was about to ruin his sister’s family and how I saved her life. Ramesh says he hates him so much and asks him to tell everyone. Vedant hopes Ramesh will have a change of heart. Purva asks Vedant what happened to Ramesh and asks why you are hiding things from me. She asks what is the deal this time. Vedant tells that he hopes Mahashivratri brings everyone together. Purva asks him to treat the root of the illness permanently. Vedant hopes Ramesh will have a change of heart. Purva says all your dreams will be fulfilled. Vedant asks really? Will you support me. Purva smiles and nods yes. Vedant gets happy. Purva thinks I will support you always. Next morning, Gomti is standing outside Purva’s room. Purva asks why are you standing like this. Gomti says so that you see me and realize that you have given me pain. Purva says I can understand your pain, I was on mandap when Rahul left me and says I can understand your pain and went through the same feelings. Gomti asks do you miss him? Purva says yes, I miss him. Gomti apologizes to her and goes. Purva thinks Mahashivratri will be happy one like Vedant wants. Precap: Gomti plays the recording and tells everyone that Purva still misses her lover. Vedant is shocked to hear her saying the same. 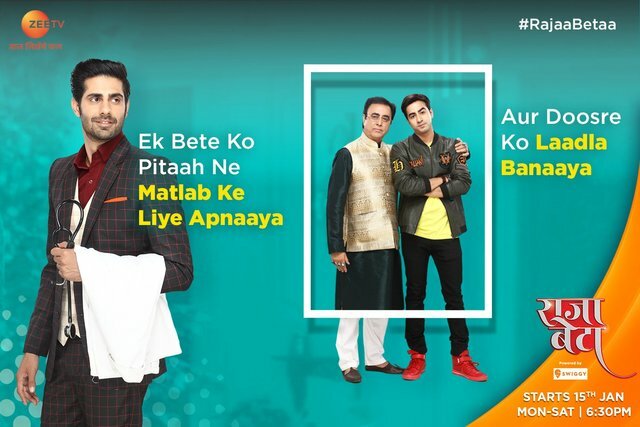 The post Raja Beta 1st March 2019 Written Episode Update: Ramesh’s behavioral changes surprises everyone appeared first on Telly Updates.